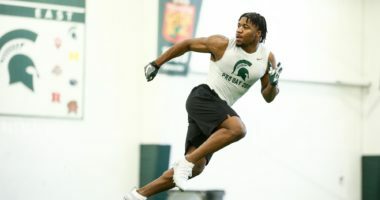 EAST LANSING, Mich. – The Michigan State football program will host its annual spring game and youth clinic on Saturday, April 13. Information on the two events is listed below. 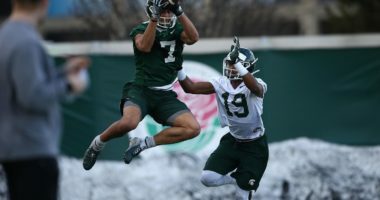 Michigan State’s Green-White spring game, presented by McLaren Health Plan, is scheduled for 2 p.m. in Spartan Stadium on Saturday, April 13. Admission is free and the stadium gates (Gates B, C, J, K) will open at 12:30 p.m. Prior to the spring game, MSU’s coaching staff and players will conduct a free youth football clinic, sponsored by Sparrow Health System. Children, ages 8-12, are invited to attend the youth clinic (no registration required) from 11 a.m. to 12:30 p.m. Gates to the John and Becky Duffey Practice Fields, located off of Shaw Lane, will open at 10:30 a.m. 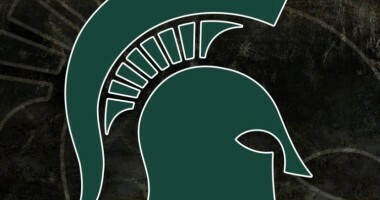 The 12th-annual Help Tackle Hunger Food Drive to support the MSU Student Food Bank will take place at the spring game. The MSU Student Food Bank is a critical line of defense for students and student families experiencing food insecurity. Facing a limited availability of food can have a negative impact on students’ academic success. The spring game will be broadcast live on BTN2Go and on tape delay on BTN at 6 p.m. In addition, Spartan Sports Network will broadcast the spring game to several radio affiliates around the state as well as online at SpartanSportsNetwork.com. 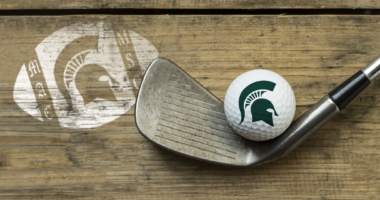 The official website of Michigan State Athletics, msuspartans.com, will provide gameday audio (via spartansportsnetwork.com), highlights and post-game quotes. For live in-game updates, fans also can follow @MSU_Football on Twitter. • Fans are reminded no bags or purses are allowed inside Spartan Stadium. This includes but is not limited to: backpacks, purses of any size, camera cases, binocular cases, wallets not stored in pockets, bags, diaper bags, seat cushions with pockets that are used for storage. If any of these bags are attached to a person’s waist or wrist, they still are not allowed in the stadium. • Fans are reminded that the “open container” ordinance will be enforced on campus and in parking lots for the spring football game.